For nearly 14 minutes, Syracuse played like they were the #2 team in country. Then, for the remaining 26 minutes of the game, the actual #2 team, Virginia, showed why they had that lofty ranking, roaring back from an 11-point deficit to win at the Carrier Dome, 59-47, and grab their second straight regular season ACC title. The Cavaliers (28-1, 16-1 ACC), who played an uncharacteristically sloppy game on offense, particularly in the first ten minutes of action, simply suffocated the Orange (18-12, 9-8) with their defense. Virginia, who came into the game averaging 8.7 turnovers per game, had nine before ten minutes were gone and finished the night with 20 miscues. However, they held SU to 38.3 percent shooting in the game and dominated Syracuse on the glass, controlling the backboards by a 42-20 margin. Of the 30 available rebounds on their end of the floor, the Cavaliers grabbed 16. Virginia converted that advantage into 15 second chance points. 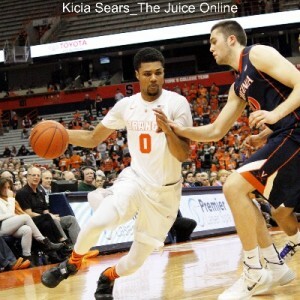 The contest started as a defensive battle, as the Orange held the Cavaliers without a point for over eight minutes. Meanwhile, SU was able to grind out a few points. Rakeem Christmas started the scoring with a pair of foul shots almost three minutes into the contest. Shortly after that, Tyler Roberson was the first player to score from the field, cleaning up his own miss with a putback, then adding another rebound score on the next possession for a 6-0 lead with just over six minutes elapsed. Coming out of the second media timeout, Virginia finally scored, but Christmas quickly answered to reinstate the six-point SU lead. Two possessions later, the senior center set up Cooney for a three-pointer and the lead was 11-2 just after the midpoint of the opening half. Nearly three minutes later, Christmas scored again and the lead was 11 points with just over seven minutes left in the first half. A three-pointer with just over six minutes left in opening session got the Cavalier offense going and triggered a 7-2 burst to cut the margin to a half dozen. Cooney hit a jumper to push the lead back to eight then upstaged a Virginia three with a long, banked trey of his own to make it 20-12 with just over three minutes on the clock. That first Virginia triple actually started a series of nine successful offensive possessions. The last five of those possessions made an 11-0 run to close the half, taking the wind from the Carrier Dome and giving the visitors a 23-20 halftime lead. The Cavaliers did not stop there, scoring on their first five trips out of the break. While the Orange hung for a couple minutes, the final three Virginia scores totaled seven straight points and gave the Cavs a ten-point lead just three minutes out of the break. In all, the Cavaliers scored on 14 consecutive possessions and turned a 13-2 deficit into a 35-25 lead. Things did not get much better from there for Syracuse. While they would get the margin down to eight, the visitors would stretch it to 14. A Michael Gbinije dunk and a Roberson bucket drew the Orange within ten and brought the crowd to life at the midpoint of the second half, but Virginia coach Tony Bennett called a time out. The stoppage worked, as the Cavaliers’ defense stiffened, holding SU without a point for nearly four minutes while they stacked six more points onto their lead to make it a 51-35 game. Trevor Cooney stopped the run with a three-point-play, but Virginia scored eight of the game’s next dozen points to push their lead to 59-42 with under 2:30 showing on the clock. 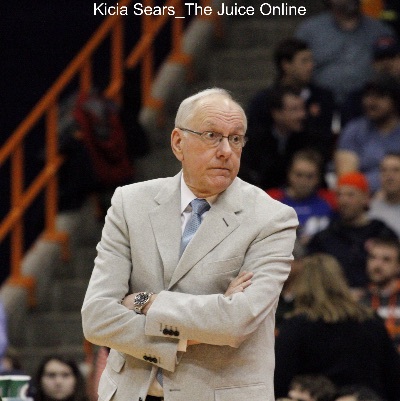 The lone high note remaining for the Orange was when Jim Boeheim lifted Christmas from his final game at the Carrier Dome, giving the fans a chance to show their appreciation with a minute to play. Trevor Cooney was the top scorer for the Orange, finishing with 14 points. Rakeem Christmas and Tyler Roberson each had ten points while Michael Gbinije added eight, all in the second half, to go with his three steals. B.J. Johnson, who replaced Kaleb Joseph in the starting lineup, also had three steals. Anthony Gill paced Virginia with 17 points (including a dozen in the second half) and nine rebounds. Malcolm Brogdon, London Perrantes, and Mike Tobey each chipped in ten points. 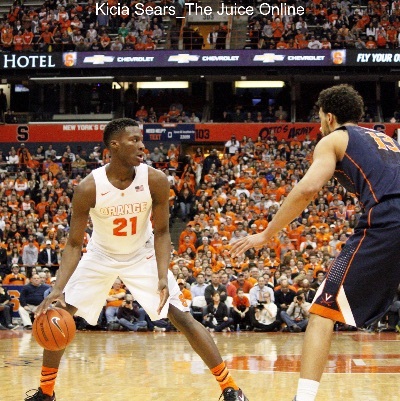 Syracuse will close their campaign on Saturday when they travel to North Carolina State. The Wolfpack (17-12, 8-8) will play at Clemson on Thursday evening prior to the Orange visiting Raleigh. Trevor Lacey leads the ‘Pack with 16.2 points per game and is joined by Ralston Turner (12.9 pts/game) and Anthony Barber (11.7 pts/game) in double figures. Tip-off is set for 12:00pm Eastern on CBS.